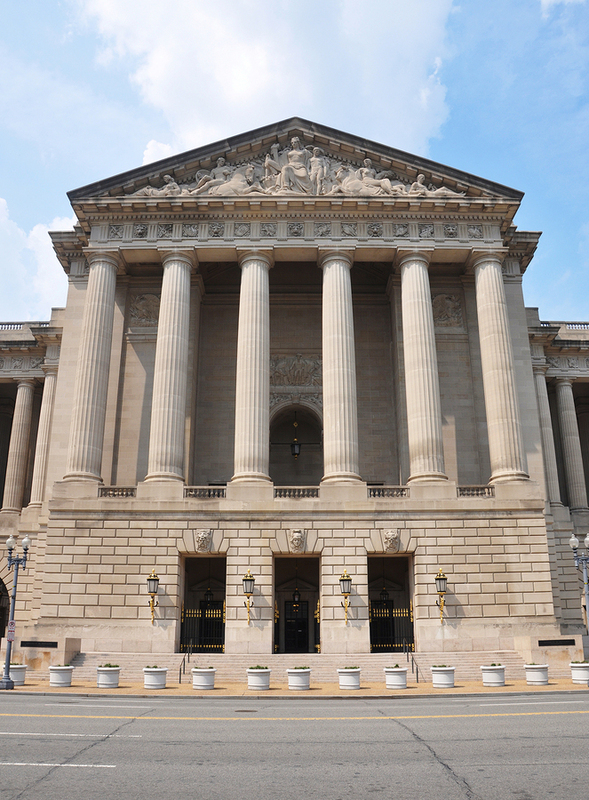 Andrew Mellon is a name that is directly associated with The National Gallery of Art, and for good reason! Mellon was one of America’s most prominent financial backers during the first part of the 20th Century and helped to launch many business ventures, but his passion always lay with art. He eventually became an artist in the field of philanthropy when he constructed one of America’s greatest museums, The National Gallery of Art. Mellon did not arrive in Washington DC until 1921 after becoming a successful banker and industrialist and the third highest income tax payer in the country. Although he was financially very successful, he was still unknown out with his home state of Pennsylvania, and only gained recognition after accepting the role of Secretary of the Treasury under President Warren Harding, and then continuing this role for Presidents Calvin Coolidge and Herbert Hoover. It was during this time in Washington that he made the decision to leave the city the wonderful contribution of an art gallery. Mellon’s primary years in Government saw the country see major financial successes and he was an extremely popular politician for providing the American people with improved finances. Much of his good work was undone and forgotten when the Great Stock Market crashed in 1929, yet his family businesses survived thus calling into question his business ties and motivation. He was, however, later found to be not guilty over questions about tax evasion. It was at this point Mellon decided to pursue his dreams of constructing an art gallery. He particularly loved British portraits and Old Masters and accumulated the ultimate art collection of his generation. During his retirement, he also pursued many more philanthropic undertakings that would support culture, research and education, and the majority of his $10 million in donations went to supporting education in his hometown. His greatest gift, however, was the donation of his 152-piece art collection to start Washington’s National Gallery of Art in 1937. Mellon only wanted the best for the museum, which architecturally was a feat in itself, and donated top paintings such as the Alba Madonna of Raphael and Pietro Perugino’s triptych. In donating this huge collection of high-quality pieces, Mellon hoped that this would encourage other art philanthropists to do the same, and he was right as many other financial leaders such as Joseph Widener, Lessing Rosenwald, and Samuel Kress all made significant contributions to the gallery after Roosevelt dedicated it in 1941. The largest gift made to the gallery was actually Mellon’s own son, who donated 100 pictures and $75 million dollars. Unfortunately, Mellon did not live to see the opening of the gallery, but his name and work have not been forgotten in the years since he died. The gallery was an immediate success upon opening, and still is one of Washington’s major tourist attractions for its vast display of art. If you are an art fan and want to see this beautiful building for yourself, check out our tours as many of them such as the DC in a Day Tour and Hop-On Hop-Off Tours, will take you to see the magnificent art pieces on display and you can learn all about the history of the famous artists who created them at this gallery.